Lydiya Konstantinovna, 74 years old, during a medical checkup with Nurse Inna Onishenko. 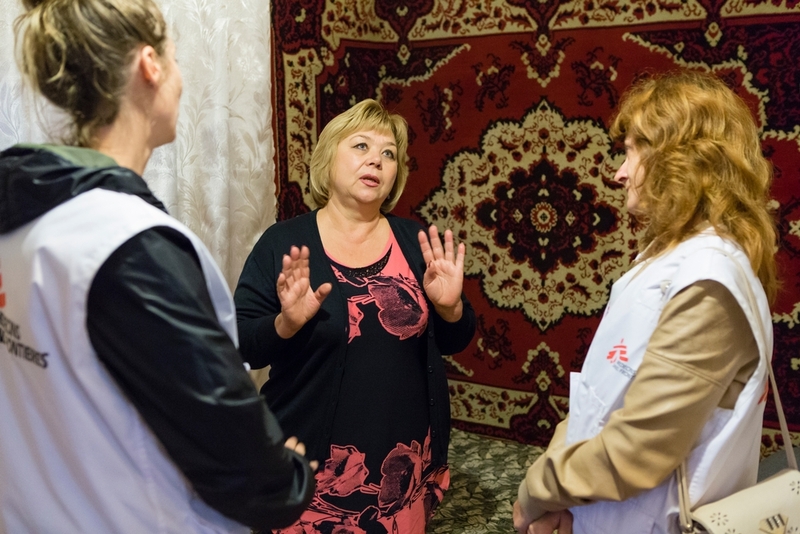 The MSF mobile clinic in Stepanivka is held in a kindergarten, which is also partially used as a health center. 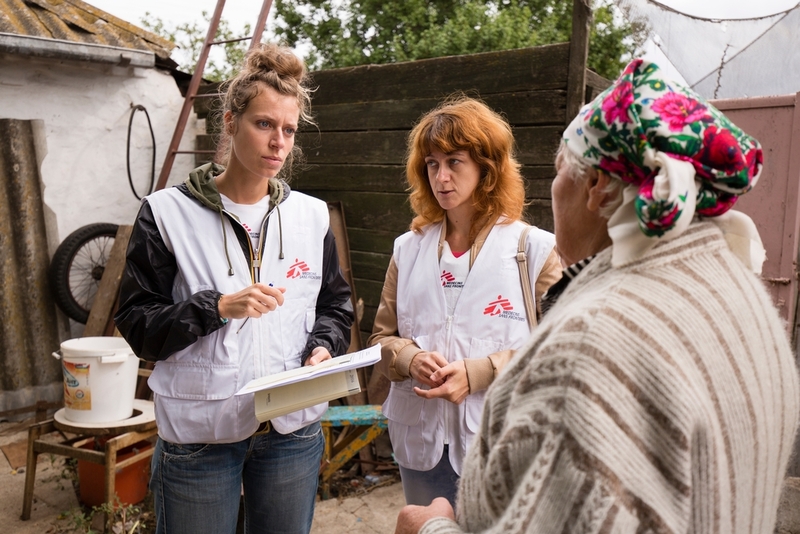 Since March 2015, Doctors Without Borders/Médecins Sans Frontières (MSF) has run mobile clinics in locations around Mariupol and Kurakhove, eastern Ukraine. MSF mobile teams—usually a doctor, a nurse, and a psychologist—provide medical consultations, medications, and mental health support to displaced people and those living near the front line areas. MSF also donates medical supplies to local health facilities and health workers, including those located at the Mariinka checkpoint. Valentina Viktorovna is a 52-year-old teacher whose life was torn apart by the ongoing conflict in eastern Ukraine. She lives with her husband in Pavlopil, a village located only a few miles away from the front line areas. After losing her job, her house was repeatedly damaged by shelling. She is now trying to put her life back together, helping others and hoping for the violence to end. Valentina and her husband get their medical care from MSF. Valentina also attends mental health counseling to cope with the stressful environment she has lived in for the past two-and-a-half years. "All my memories are in this village, it is here that I have built myself a life and raised our two sons with my husband. It used to be such a beautiful place; people would come here to spend summer time alongside the river. There was even a plan to build a tourist resort. I used to be a teacher in the village primary school. I loved my job. I kept all the drawings and pictures from my pupils. I was forced to retire when they closed the school. It became too dangerous for the children to stay, as shelling was happening close by. So now, at only 52, I am already retired. Fortunately my husband still has his job at the factory. I can’t get used to it, to this slow rhythm. If I had to compare it to something I would say I was like a high speed train that has been brutally stopped. So now I keep myself busy with volunteer work here and there; go and meet the other families from the village and see how I can be helpful. This is how I find meaning in this new daily routine: assisting others. There has been so much shelling near the house, so it is very damaged. It looks like it is going to fall on us. I can still remember the first time, the noise, and how everything was trembling around us. I was so afraid, picturing ourselves rushing out of a completely destroyed house. Luckily enough, the house is still standing, but it will take us time to fix it as we can’t afford to pay for the repairs. During the shelling, my husband and I used to sit here in the living room, away from the windows, in the complete dark with the hanging lights on the ceiling shaking above our heads. We thought keeping our minds busy would be helpful to reduce the fear, so we started with this habit of playing games and riddles. This conflict has torn families apart. Many left the village and some others left the country, like my eldest son. Even the ones who stayed in the region are afraid to come and visit because, even if it is quieter now, the situation is still unstable. I don’t get to see my sons and grandchildren often so I keep their pictures and drawings on this wall to have the feeling they are here with us. I miss them so much. We were just left with nothing. Fortunately we received support from organizations. I hope that this violence will come to an end soon so we will be able to go back to our lives. Maybe it will help . . . tell people what is happening here." "Pavlopil Used to be a Nice Place to Live"
Taisiya Gregorivna, an 82-year-old widow, has lived in Pavlopil in eastern Ukraine for the last 46 years. Taisiya's village is situated just a couple of miles away from the front line, and the ongoing conflict has taken a heavy toll on her and her neighbors. Taisiya’s house has been shelled twice since the violence began in 2014, forcing her to flee to a safer place for a long period of time. After receiving support from her family to rebuild her house, she is finally back home. Taisiya suffers from a heart condition and, over the past months, has received medical care from MSF, including mental health support to help her cope with what she has been through. "I was born in Russia. Before coming to Ukraine, I used to work on a farm taking care of the livestock. I arrived in Pavlopil in 1970. Here I got married, built our house, and had four children—three daughters and a son. I can’t recall exactly when my house was first damaged by shelling, but I remember being very scared. Two shells hit the road, just in front of the main entrance, with shrapnel damaging the walls and some windows. The second time was during winter. I was alone in the house, and it was a very dark night outside. The roof was shelled twice. It was destroyed, together with some of the rooms. All the windows also broke apart. I called my daughter who lives in Mariupol and left for the city the day after. It was unthinkable for me to stay alone here, it was too dangerous. I stayed in Mariupol with my daughter and her family for months. Sometimes, I would go back to Pavlopil for a few days, but the situation was still too volatile for me to come back home and I was too scared at night. One night, I was in the kitchen in my daughter’s flat in Mariupol when a shell hit the place. I remember saying to myself, 'God saved me, for the third time, because I have never cursed in my life.' I was grateful that my grandson had left the kitchen just a few minutes before the shelling. I don’t want to think about what could have happened to him. I came back home to Pavlopil about a year ago. One of my sons-in-law helped me with all the repairs. We managed to partially fix the roof thanks to the factory where one of my daughters works. They gave us the necessary material for free. He also helped me to fix the bedrooms and other parts inside the house that were damaged. But some parts of the roof still need to be fixed. However I can’t afford to buy the sheet of metal. So for now it will just have to stay like that. One of my granddaughters also got her house destroyed because of shelling. Since then she is always scared. She now has diabetes. I am so worried for her, she is only 22. All the families here have been deeply affected by the conflict. Pavlopil used to be a nice place to live. But since the conflict began the school has closed, because of shelling nearby. Only two small shops have reopened. Somehow, this is already an improvement as for months everything was closed. At the time, I was fortunate enough to have my children bringing me food every week. Now that the situation is a bit calmer I feel more or less alright. I am able to go back to my daily activities. I have a bad heart condition but I do my best and I keep myself busy taking care of my house, my garden, and my chickens. Without this, I would have died already. I am so grateful for my family—my four children, six grandchildren, and eight great-grandchildren. They are a great support. They take such good care of me; they are the ones who helped me to get my home back. Look around, others didn’t get so lucky."